Every Saturday, I host a feature called Kid Konnection -- a regular weekend feature about anything related to children's books. This week, I'm going to share with you some very cute picture and board books. LITTLE BLUE AND LITTLE YELLOW by Leo Lionni is a wonderful children's classic. It was actually Mr. Lionni's first book (he wrote it in 1959 before board books were even invented! ), and I'm extremely excited that it's being re-released as a board book. LITTLE BLUE AND LITTLE YELLOW was a New York Times Best Illustrated Book of that year, and I have to say that it's timeless. I found it to be positively delightful. LITTLE BLUE AND LITTLE YELLOW tells the story of two friends who just happen to be blue and yellow blobs of paint. The loved to play with each other and had many different games; however, one day, they couldn't find each other. When they finally discovered each other again, they immediately hug and, of course, turn green. They eventually return to their own colors (and, therefore, recapture their identities) and teach young readers some valuable lessons! I absolutely adore this fun little story, but the illustrations are outstanding too. They encompass everything I've come to know and love about a Lionni book. They are simple, yet bright and colorful, and sure to capture even the youngest one's attention. 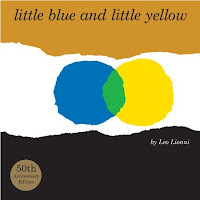 I especially enjoyed LITTLE BLUE AND LITTLE YELLOW because, not only was it a cute story about friendship, but it also introduces the concept of mixing colors. A must-have for all children's book collections! Think Christmas or first birthday present, or possibly even a baby shower gift! 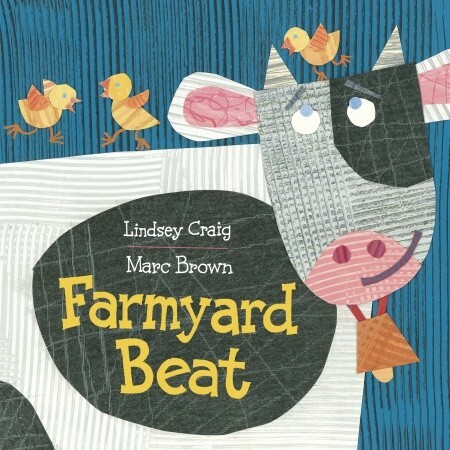 FARMYARD BEAT by Lindsey Craig and illustrated by Marc Brown is another cute book which is ideal for little ones. When the farmyard animals can't sleep, they have a big dance party. They all have so much fun that they eventually tire themselves out and fall asleep! I thought FARMYARD BEAT was precious! Booking Son informed me that it was a baby book (and it definitely is geared towards younger kids), but we still giggled a bit when he read it to me. I think toddlers will most appreciate this book and I'm fairly confident that they will the cute story and the rhyming cadence. I also think they will enjoy making the various animal sounds with the reader. My favorite part of FARMYARD BEAT is probably the illustrations by Marc Brown (of Arthur fame!) They are, of course, adorable, but they look a little bit different than most of Brown's books. You can see a slight resemblance to some of his other characters in the faces; however, these drawings have a more textured appearance -- almost a mixed media look. I'm probably not using the right "terms" so just look at the cover to get an idea of the patterns. I highly recommend FARMYARD BEAT to toddlers and preschoolers -- it's a perfect bedtime story! THE BUSY LIFE OF ERNESTINE BUCKMEISTER by Linda Ravin Lodding and illustrated by Suzanne Beaky was probably the book most geared towards Booking Son's age -- and probably the book that he most enjoyed out of these three stories. It was a very cute story, with adorable illustrations, but the real beauty of this book is the ultimate message. It's one to which most kids will relate, and it's definitely one to which most parents need to be reminded. Maybe I'm only speaking for my own family, but I have a feeling that we aren't alone! THE BUSY LIFE OF ERNESTINE BUCKMEISTER tells the story of Ernestine, a young girl who is over-scheduled. She has activities every day of the week and is extremely tired... of everything. Her parents have the best intentions -- they definitely want the best for Ernestine; however, they fail to see that kids need to be kids. And Ernestine just wants some time to play! This book resonated with Booking Son and I in a major way. In fact, when he started full day school this year, he was overwhelmed with his busy schedule and very tired. He didn't like anything -- school, karate, or soccer; and he was starting to act out. We decided that he needed to cut back on karate even though he loves it just so he could keep his sanity. It was a hard lesson, but a necessary one for us; and I do know it benefited him to have some down time. 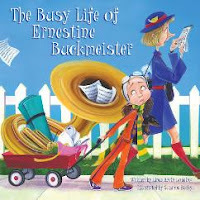 After we read THE BUSY LIFE OF ERNESTINE BUCKMEISTER together, we discussed Ernestine's experiences and compared them to his own. He told me that he understood Ernestine and felt like her when she was sad because she didn't have time to play with her friends. It broke my heart, but we're trying to find some sort of mix between play and activities. I have a feeling that it's going to be a constant battle in today's society. As a parent, I highly recommend THE BUSY LIFE OF ERNESTINE BUCKMEISTER. It has an important message, but it also provides the opportunity to open up communication between parents and children. Thanks to the publishers and author for sending copies of these books. I've never heard of Little Blue and Little Yellow, but it looks wonderful to me! My Kid Konnection post today is this amazing true story about a slave who had himself mailed to the north, and it's a book illustrated by Kadir Nelson, so you know it is beautiful! THE BUSY LIFE OF ERNESTINE BUCKMEISTER rang so true - and I have in mind my sister's two girls who are now 14 and 17. Their entire lives have been like this, with softball, cheering, basketball, church activites, flag, golf, vollyball, pagents, 4-H, choir....I'm sure I've missed something there - and the older one had trouble with her grades up till the last year, and now the younger one has started having trouble with her grades two years ago (and I mean D's, not just slipping off the honor roll). My sister sees no trouble with it, as she herself functions on a totally overbooked schedule herself - it's utter chaos, and if something pops up - like illness with our parents - take a guess who is there, because little sis is "soooo busy with the girls" - O wait! Maybe there is method to the madness??? Oh, I'm SUCH a sucker for Leo Lionni!! THE BUSY LIFE OF ERNESTINE is such an important book, especially because as parents sometimes we get caught up in wanting to give our children the opportunity to do everything. I, too, cut out some extracurricular activities when my kids had enough. It's okay sometimes to just lounge around at home and putter in one's room rediscovering new books or old toys. And yes, Leo Lionni is fabulous. My son is almost two so I put the first two books on my list for him. Thanks! I think my nephew would really like The Busy Life of Ernestine Buckmeister. I think it's great that the book prompted a discussion with your son. I haven't heard of ERNESTINE BUCKMEISTER - thanks for sharing your review, I imagine this one would be a hit here, too. Little Blue and Little Yellow was one of my boys' favorite books when they were younger. It has such a great message.